As pet owners we all want to do the best we can for our pets, but there seems to be a lot of confusion about just what is an optimum diet for our furry carnivore companions. We are told by the pet food industry as well as many pet professionals that even lower grade kibbles meet the nutritional requirements for our pet dogs, cats and ferrets. Then we see all the diseases and allergy symptoms that our companion animals are developing, most becoming prevalent in only the past twenty years or so. We wonder why this is and depending on where we look we may come up with numerous answers. ​ Traditional veterinarians, television commercials and other advertising from pet food conglomerates are the sources where most Americans get their pet care information, and these usually just repeat what they have been brainwashed to believe, or they may have an ulterior motive and only want to sell us their specially formulated brand of kibble. Those pet owners that look closer into what their pet actually needs will come to find that their pet is a carnivore and actually needs a very simple diet of raw meat, bones and organs. So why are the kibble companies still in business? Why are so many companion animals still so sick? Why is everyone not feeding their pet a raw diet? I have found there are a few key reasons why everyone is not feeding a species appropriate diet, as well as the answers to those excuses, because that is all they are, excuses. The root of all the excuses is fear, plain and simple. Fear is merely False Evidence Appearing Real, but so many cannot discern this fact. Fear of many things; including fear that the diet won’t be nutritionally complete, fear of germs, fear their dog will choke, fear that they can not figure out how to go about feeding this revolutionary new diet(although the raw diet is as old as time), fear that they can’t afford to feed a raw diet. The only two reasons, not related to fear, that I could come up with that a person would not feed a raw diet is that they are ignorant or lazy. In other words, they were raised in ignorance of the true nutritional needs of their pet and in ignorance that there is even another way to feed a pet besides kibble or canned food. The other reason is the saddest one of all, and that would be that they are just plain lazy and don’t care for their pets enough to want to spend the little extra time it takes to research and learn and then to source and prepare the pet’s food each day. Other than prayer, education and gentle guidance or maybe a swift kick in the rear, there is little we can do to combat the lazy pet owners. But, the majority of these fears can be overcome through education and learning. Pet owners can find information about Species Appropriate Nutrition via books, seminars, online, or by taking educational courses. Pet owners can now even access information through social media outlets such as Facebook groups that are geared towards natural care and raw feeding or similar online forums such as Yahoo. For pet owners that feel they need more in-depth knowledge than they can access or feel they may need one-on-one help, these pet owners should consider consulting with a Naturopath, Carnivore Nutrition Consultant or Natural Pet Health Coach. ​ Many times the first place a pet owner turns for nutritional advice is their Allopathic Veterinarian. This is, in most cases, a big mistake, as most vets are only minimally educated in carnivore pet nutrition and have even been fed the untruth that dogs, cats and ferrets are omnivores. Their college education does not require extensive classes in nutrition and what they do receive is usually taught by a representative from a kibble company. Vets have received their marching orders from the A.V.M. A. (1) and will refuse to discuss a raw diet and may even try to scare a person off of feeding raw, and encourage them to buy the kibble or canned food that they sell in their clinic. The pet food companies provide the nutrition education and push their own brands in the process. I have seen this fact for myself at a local university’s veterinarian college. There were kibble company posters all over the place, paraphernalia of all sorts featuring the company’s name and/or brands as well as literally stacks of complimentary kibble lining the walls for the students and faculty, and even a modernized classroom named for one company. Many reputable veterinarians have made similar remarks in regards to their own core nutritional education as well, such as Dr. Richard Pitcairn, who says, “ My veterinary school training in nutrition had included little more than the admonition: “Tell your clients to feed their animals a good commercial pet food and to avoid table scraps.” Beyond that, nutrition just was not considered an important part of our education. I accepted that at face value.” (2) What is scary is the majority of vet school students do accept that at face value and never investigate any further on their own what is truly the best diet for companion animals. Veterinarians have a bottom line to cover and profits from sales of kibble contribute to their profits greatly, along with increased visits from sick pets, and profits from medications and other chemicals being sold in the clinic. I don’t think that most veterinarians truly want pets to be sickly, but I feel like they are not going to examine a cash cow too closely. So the vets feed the fear of their clients by telling them that feeding the special or prescription food their clinic sells is safest and best. My husband often laughs at me for getting mad and arguing with the pet food commercials that come on television with claims to be “all natural” and “real meat as the first ingredient“. Cue the sappy music and videos of talking puppies, dog & human best friend running through fields of wildflowers. And the lies. Well, I get so mad I can’t see straight! People seem to believe this myth that companies must practice truth in advertising, that they are held to a standard by law, but they are not. The pet owning public needs to understand that the kibble companies are in business to sell a product, one that they manufacture as cheaply as they can get away with. They are not in it to make your pet happy and healthy, they are making their bottom line healthy and that is about it! When I am discussing raw feeding with some folks, they tell me they have fed their pets kibble for years and they are just fine and have lived for years on kibble. They don’t understand that their pet could have thrived, and lived life to a whole new level and possibly lived years longer. I too thought the same thing once. My late Rottweiler lived to be 13.5 years old, and I was told that 10 years was a long life for her breed. Her whole life, she had a dull coat, foul odor, yeasty ears and feet, she shed horribly and had digestive issues as well. I thought I was doing good because she lived longer than the vet expected. I just wish I could have known what I do now and could have seen how healthy and long lived she could have been! Feeding species IN-appropriate foods over a pets lifetime will cause avoidable illnesses and will shorten and lessen a carnivore pet’s quality of life. ​ There are several myths that pet owners accept as fact. One of these is that feeding a pet raw meat would make it viscous or more aggressive towards other pets or human members of the family, or even towards livestock. This is a myth perpetuated by vets and fearful people due to probably a fear created from one pet “resource guarding” their food, a pet that was most likely not properly trained to begin with, and the incident probably would have happened with a toy or kibble or a bone or raw food at some point. People neglect to realize that raw food is not what is the cause of pet bite injuries. Most incidents of dog bites occur with junk food fed pets, according to Dr Tom Lonsdale, which tend to be more excitable and harder to train. (3) Most likely because of the high sugar and carbohydrate content, dyes and other harmful ingredients in their diets. Another worry pet parents have is that their pet will get parasites(worms)from eating raw meat. There are several things that a raw feeding pet owner can do to make this a non-issue. The first is to freeze the meat. Some advise freezing meat for only 48 hours, some advise freezing it for up to two to three weeks. Most grocery store meats you get will have been frozen previously, but freshly butchered meat or wild game will not. Another consideration is to know your source. Factory farmed, or poorly cared for animals for slaughter will have a higher risk of parasites and transmittable disease, while clean, pastured, sensibly raised slaughter animals will have less risk of having parasites. It is especially advisable to freeze wild game before feeding, and to only use healthy looking specimens, and to only feed herbivorous wild game animals. While it takes a little more time and care to hunt wild game for your pets to eat or to source it from friends, it is well worth the effort in the quality of meat as well as the additional variety you are able to add to your pet’s diet. Depending on the part of the world in which you live, raw feeding can be more affordable, about the same or more expensive than kibble. It helps to keep the cost down if you are a savvy shopper, are willing to network and find unusual sources, are able to butcher animals yourself and are knowledgeable about the variety of feeder animals you can provide for your carnivorous companion. While it does depend on where you live, what your “staple” meats are, most people stick with the typical bargain chicken, beef, Feeder mice, turkey, lamb or pork meats that are most commonly and easily found. Some people order from a local co-op, a packing plant, butcher, abattoir, farmer, or online stores and get more exotic meats that may also be organic or pasture raised such as ostrich, kangaroo, buffalo, different fishes, rabbits, mice and many other “exotic” meats, some of these can be pricey and some are surprisingly affordable. Having a full size freezer (or two) will help keep expenditure lower, because a person can stock up on deals or whole game animals, when hunter friends clean out their freezers to make room for the next year’s meat, or any other money saving opportunity that may come their way. Each person should research for their area to find what works for their budget and schedule and needs. You should not scrimp on quality meat because you will end up paying that money in the long run, in vet bills or for health products or medications that could have been avoided. In comparison of spending a little more up front on raw feeding a pet, or feeding a bargain priced kibble or even a more expensive (“quality”) kibble a person will definitely spend more money over the life of a pet for the kibble, vet bills, medications, time missed from work caring for a sick animal, and heartache, not to mention the fact that a pet’s quality and quantity of life is so much better when it is raw fed. So there really is no comparison that can be made. ​ I have been told by a breeder, that he cannot afford to feed all the dogs he has on a raw diet, because he has so many. My answer to him was that he needs to examine whether he can truly provide quality care for that many dogs in the first place, and maybe he should consider downsizing his operation. If one cannot afford to feed a dog(or dogs) the food they are meant to eat, then they should consider having a smaller pet or none at all. That seems harsh to some, but is a fact of responsible stewardship of pets, that many people must face up to. The fact remains that some people are just too lazy (or busy) to feed a raw diet, I would suggest that their complete lifestyle and the time spent caring for their pet needs to be addressed. Some creative solutions and compromises could be found, such as the time spent scooping copious mounds of feces from their lawn will be a chore of the past with a raw diet, because of how the poo quickly dries up and crumbles to powder. No more time off from work to take the dog to the vet or the groomer because of smelly, itchy skin and greasy, shedding coat. Even consider the additional time that will be saved, not having to clean up messes the pet has made from excess nervous energy that comes from the added sugars found in kibble! This will more than make up for the extra few minutes that it takes to prepare the pet’s meal. Preparation time can even become a training session in how to eat nicely from someone’s hand and not be food aggressive, or teaching the wait command, and how to eat nicely near other animals. If these type of folks will slow down and look at the bigger picture, they will see that a species appropriate diet is best for their pet overall! Plenty of people will agree that a raw diet is what is optimal for pets, but then they say they feel that some other diets are just as good, comparable or acceptable for cats, dogs and ferrets. The challenge is getting them to see that a biologically appropriate raw diet is the ONLY choice for our pet carnivores! The argument continues to rage over whether a dog is a carnivore or an omnivore even though there has been no conclusive proof that a dog is an omnivore. There is plenty of evidence that dogs, cats, and ferrets are carnivores. A carnivore’s instinct is to hunt prey, not vegetables or grains, and rip and tear the prey up then consume it as quickly as possible, just like their larger cousins, wolves, lions and weasels. We can next look at the saliva. “Unlike human saliva, the saliva of domestic animals does not contain enzymes to initiate digestion.” (9)7 While researchers have quite recently “found that dogs have more copies of a gene called AMY2B, crucial for amylase production, than wolves. And in dogs, this gene is 28 times more active in the pancreas than in wolves.” (10) This still does not prove that dogs have ever, or will ever, need starches in their diet! Moving on we can see that the esophagus is a muscular organ that moves food down to the very elastic stomach which has numerous folds (11) that allow it to expand as well as contract to help pulverize the foods while the strong stomach acids and enzymes work to break down the meat into the proper composition for assimilating all the nutrients. Carnivores have a particularly acidic stomach environment with a PH of 1-2 and strong Hydrochloric Acid that breaks down meat as well as kills harmful bacteria. Any bad bacteria that does survive is passed through a carnivore’s digestive tract quickly, in a matter of hours, before it can cause any problems unless the dog is being fed inappropriate food items that slow up the digestive rate, such as grains or vegetables. The digestive tract of a carnivore is by design, shorter than an omnivore or herbivore, so that the digestion can be completed relatively quickly. The waste that a raw fed carnivore excretes is typically of a small amount, is firm and dense, it quickly dries up and decomposes, returning to the earth to complete the cycle of life. If you do not handle the excrement you will never have a problem with contamination. If desired the waste is easily picked up and removed. ​Our carnivore companions truly need a healthy raw diet to thrive, rather than just survive. What exactly does it mean to “thrive”? According to the dictionary, “thrive” means 1. To make steady progress; prosper.2. To grow vigorously; flourish (12) Just because a pet has energy does not mean that it is healthy. Simply because a pet has not been ill so far or even has lived a “long” life, does not mean that it is truly healthy and thriving to its fullest potential. Pet owners today do not even understand that our dogs and cats should live for 20 to 30 years, possibly even more for some, sadly they believe 10 to 15 years is a full life and an old age for pets. A well nourished raw fed pet will have a calm, balanced energy, it will grow slowly and steadily, will maintain a healthy weight and muscle mass, will not have nervous energy, or develop many destructive behaviors that junk food fed pets do, it will have a sleek, shiny, clean coat that does not need frequent bathing, only routine brushing, healthy teeth and gums, without intervention of professional dental care. A thriving pet will age slowly and gracefully, and will only need a minimum of veterinary care over the years. A thriving pet is healthy all the way down to the cellular level. A nutritionally sound raw diet is based on whole carcasses. Dr Tom Lonsdale says dogs should really be classified as Carcassivores. (13) But most people cannot provide a full time diet of whole carcasses, so they use what is generally called a “prey model” and the guideline of 80% muscle meat -10% bone -10% organ- half that (5%) should be liver and half (5%) should be secreting organ(kidney, pancreas, brain, etc) . Some use the guidelines of 40-60% raw meaty bones, 15% organs and the rest boneless meat. These are merely guidelines, not hard and fast rules, and the amounts will have to be adjusted a little for each pet’s tolerances. Whole carcasses (portion/sections) should be fed whenever possible. Large pieces should not be routinely ground or cut up in small chunks except for special need reasons. Bone portions (usually called RMB’s) should be given as bone-in meat. It is truly impossible to know what a perfectly balanced diet would be for a carnivorous animal, so do not worry about trying to provide a perfectly “balanced” diet, reminiscent of the jargon the kibble companies come up with as a marketing ploy. (14) It is crucial that you provide a variety of meats, to provide all the amino acids, vitamins and minerals your carnivore pets needs. The variety will allow them to assimilate the nutrients in the most bio-available way possible, from a variety of natural sources. The more variety the better, any type ‘prey’ animal- chicken, beef, pork, lamb/sheep, goat, fish, bison, elk, venison, turkey, rabbit, quail, squirrel, mice, duck, eggs, etc. No meat-eating animals should be fed to dogs. You need “balance over time”, so it is ok to feed the same type of meat for several days in a row. Over a month’s time you should provide at least 3 or more different protein sources. Try to think about the prey a wolf, lion or weasel would be eating in the wild and try to mimic that in variety and proportions for your dog, cat or ferret..
​ Never feed cooked bones of any kind. Cooking softens bone and causes it to splinter and can cause all sorts of problems, like choking and sticking in or through the intestinal wall. Cooking also removes most of the nutrients your dog needs and makes bone harder to digest, which could cause an impaction. Weight bearing bones (especially from large herbivores, like cows) tend to be dense and have been known to break teeth, try to stay away from those or take them away when all the meat is stripped off. Vegetables, fruit and grains pass through a carnivore’s short digestive tract without being digested, so the pet gets no nutritional value from them. Even fed regularly in small amounts or pureed, they can cause digestion to slow and stress to be put on the pancreas, causing disease as your pet ages. Veggies and fruits are not needed as part of the overall diet. Select herbs, grasses, leafy green vegetables, and ripe fruits and berries can be given two to three times a month, as a treat type supplement. The world is not what it used to be and our soils are becoming depleted. So you may choose to supplement with a few things as needed. Fish Oil or Krill Oil if you are not feeding grass fed meats. Coconut Oil, Aloe Vera (anti-viral & anti-fungal), Probiotics, either fresh green tripe or SBO’s (Soil Based Organisms) and Bovine Colostrum or some other Immune System Building product can be used as supplements. Again this will need to be chosen and adjusted for each specific pet and is not necessary for each and every pet in every situation. The amount each carnivore pet is fed will depend on your individual breed, lifestyle, and exercise level. A guideline to start with is 2-3 % of ideal adult body weight daily or for puppies/kittens, 5-10 % of their current body weight. Adjustments can be made by watching the pet’s body condition. You should be able to feel the ribs without pressing hard on the pet’s sides as you run your hands down the pet. Puppies and kittens should be fed 2-6 times a day depending on if they are weaned and their age. You can begin to reduce the number of meals the older the puppy gets. Adults should ideally be fed one time a day. I recommend not feeding at a set time each day, wild animals do not eat at a set time, and this will keep your pets from having bile pukes if they are not fed right on an exact schedule. Pets should take to raw food fairly easily, but some may need some encouragement. An adult can be fasted for 24 hours before switching to raw, but do not fast cats, kittens or puppies. You may have to practice some “tough love” and only leaving the food down for 15 to 20 minutes then putting it away until you try again hours later, this will help even stubborn pets decide to try something new. Cutting ribbons into the meat or allowing to warm to full room temperature may help your pet adjust. There are numerous tricks that can be tried, and after your pet gets the hang of it, and is happily crunching away on a raw meaty bone, you will feel satisfaction of knowing that your pet is truly being fulfilled with what he needs to thrive. Whether raising a pet straight onto a raw diet from the very beginning or switching over a pet that has been getting kibble all it’s life, your pet will surely thank you. If you dispel the myths and fear, feeding a carnivore pet what it really deserves is easy and rewarding. You know that you are giving your pet the food it’s body craves and can see the glowing good health, and great temperament. You know that you are doing everything possible to ensure that you will have your best friend there with for as many quality years as possible. If you would like a Raw Feeding Consultation or one on one coaching, please see my CONSULTATIONS page. 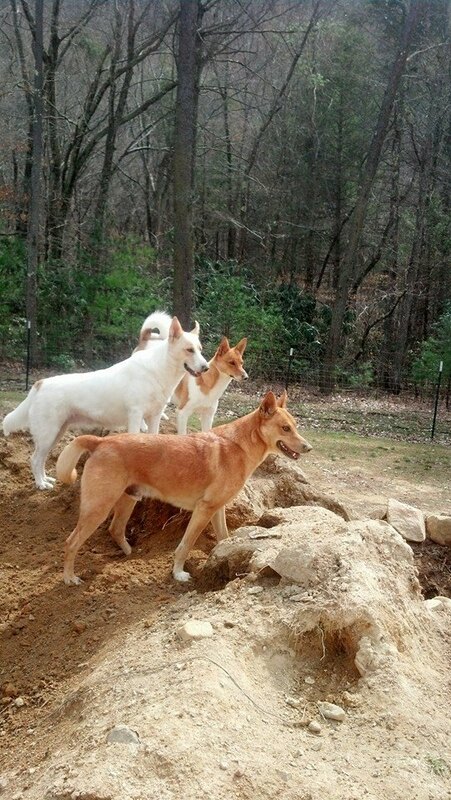 All articles, pictures, and other content on this site is the property of Susan Lewelling, Nature’s Way Pets and East Tennessee Dingos or its original creator and reproduction is prohibited without express written permission. You are welcome to share a direct link to a page or article found on this site. Making the decision to switch our golden retriever from kibble to raw was one of the best decisions we made as dog owners. It is amazing how quickly we noticed changes and improvements in her. Today, less than a year later, she is a completely different dog and I know that when the time comes to add another dog to our family, raw feeding is the only way I’ll go. While I am looking forward to including the raw diet on my blog, the best place to see what’s in my dog’s bowl is on my Instagram – http://instagram.com/marleyjustine_/ or my ‘Raw Dog Diet’ Pinterest board – http://www.pinterest.com/marleyjustine_/raw-dog-diet/ I hope you’ll check those out, and watch for raw related posts on my blog.